The Massachusetts Convention Center Authority alerts us that if you see lots of cops and EMTs swarming the Massachusetts Convention and Exposition Center tomorrow, remain calm: It's just a training exercise for dealing with an active-shooter incident. Read more. The Boston Licensing Board voted yesterday to issue a warning to the Massachusetts Convention Center Authority over an incident at the Pax East show in April in which security guards locked a front entrance at the South Boston convention center to funnel attendees into metal-detector lines. Read more. A front door that security officials at the South Boston convention center locked to better secure the facility during the Pax East show in April got the convention-center authority hauled before the Boston Licensing Board today because police said it would have impeded people getting out in an emergency. Read more. The Massachusetts Convention Center Authority's Lawn on D wants to add wine and beer - it finds out tomorrow if the Boston Licensing Board has any spare licenses lying around to make it happen. Read more. The Boston Business Journal reports state legislators reached accord late last night on a bill that would not bar ride-hailing services from the two locations but would add a 20-cent fee to every ride for a new state office to oversee the services and ensure riders go through background checks. Lawmakers rejected a bid by taxi operators to make ride-hailing drivers also get fingerprinted. 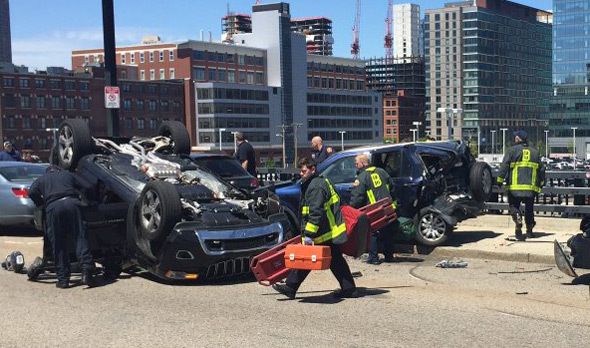 Matt Di Stefano reports this SUV flipped like a pancake on Summer Street after hitting two parked cars around 1:40 p.m. Read more. 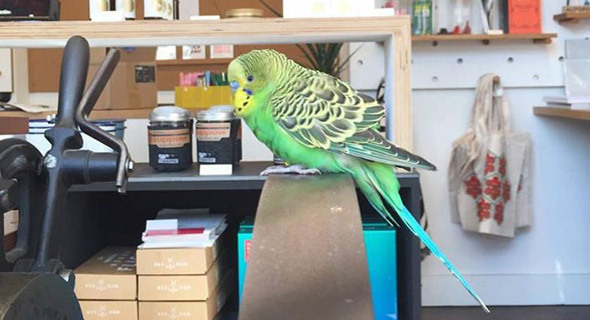 Anybody missing a parakeet in South Boston? Loyal Supply Co. reports rescuing this bird from a "cold, dark loading dock" at the South Boston convention center this morning. They got him a cage and some food, but wonder where he came from. 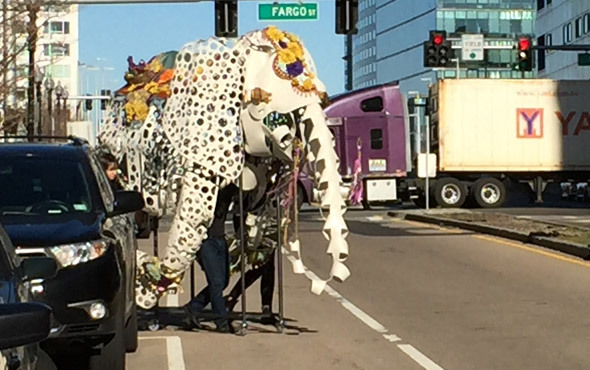 Payette, a Congress Street architectural-design firm, designed itself Pearl the elephant as part of a circus-themed display at the International Interior Design Association's fall New England fashion show earlier this month. Yesterday, staffers wheeled Pearl over to the South Boston convention center for the Architecture Boston Expo. Tamas K-L shows us the inside of the convention center during tonight's Bernie Sanders rally. The Globe reports the Baker administration wants to study the ramifications of the proposal. Yeah, they're wearing boxes on their heads - so? Macleodphoto ambled about the Pax East show at the South Boston convention center today. The Globe gets the scoop on a plan to use small self-propelled diesel cars to shuttle people between the Seaport and Back Bay station via a short and dormant track the state acquired in last year's CSX deal. For you oldtimers, think Budd cars, only more modern. And, yes, the state is planning on buying some of the units for use on the Fairmount Line, too. 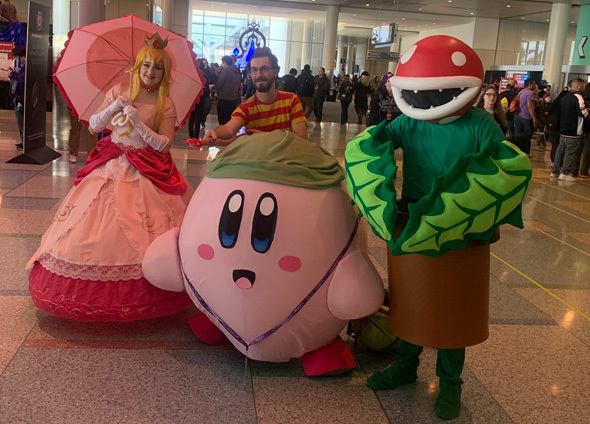 Pax East is not your typical convention-center kind of exhibition. 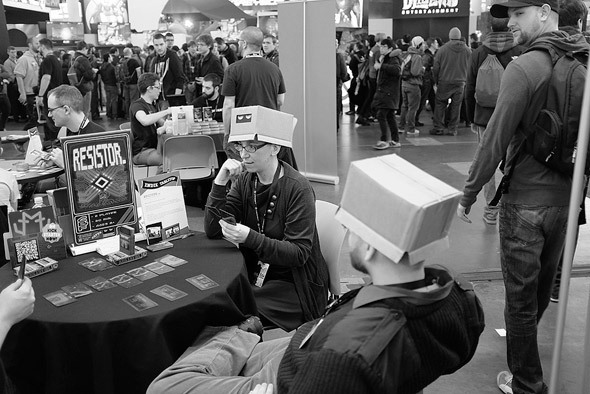 Pax East is in town this weekend, bringing a deluge of gamer geeks to town. And yes, there's already been one Mario and Luigi sighting. Seems that when a big convention is in town, the MBTA runs special Silver Line service to the airport straight from the convention center, rather than making people carry their bags on that long walk to the nearest Silver Line stop and crowding onto a bus there. Jeff Cutler reports from the New England Auto Show, which runs through Monday at the convention center.